Taking on the challenges of water damage restoration for the people of West Jordan is a daily experience for Yoav Gueron and his teams of professionals with 911 Restoration Salt Lake City. This is how they have amassed the expertise and skills required to take any water damage West Jordan situation and turn it into an opportunity for the home or business owner. When Yoav and his staff get to work, they do so much more than merely extract the water from a property. They give home and business owners the ability to turn the rebuild into the space that they’ve always wanted. Going the extra mile for his clients is just how Yoav and his teams do business, so if you’ve found a leak in your home, or you’ve already had water damage and need it solved quickly, then contact 911 Restoration Salt Lake City today for help! Yoav and his crews know the area of West Jordan, and all of the Salt Lake region for that matter, experience a wide range of temperatures and weather patterns throughout the year. Winter can be particularly brutal for homes due to the expansive capacity of freezing water and all the damage that this can create. That being said, knowing these extremes and preparing for them can save homeowners and businesses alike from a lot of stress by preventing a water damage crisis. Ice dams can be particularly destructive to the layers of the roofing materials in any home, and avoiding them can save property owners from thousands in roof repairs or replacements. Simple maintenance of the gutters goes a long way in preventing larger issues when winter arrives. In addition to cleaning gutters and downspouts, homeowners should also never let the temperature of their home drop below freezing. This helps to keep pipes from freezing with water in them and then bursting under increased pressure in the lines. Spending money on the heating bill may seem pricey now, but in comparison to the costs of a large restoration project, it is well worth the value. When Yoav takes on a job, he doesn’t just do so with all of the latest drying equipment and technology, he also does so with a positive attitude that always gives home and business owners the relief they need to make informed decisions about their restoration needs. 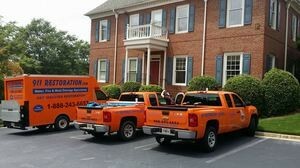 Yoav and his crews know that providing the homeowner with a much needed calm after a water damage situation is a critical part of the disaster recovery and restoration process. No one expects their home to flood, but when it happens, you need a professional who can not only assure you that it will all be fine, but one that can actually make this so, and that’s why Yoav is so good at his work. 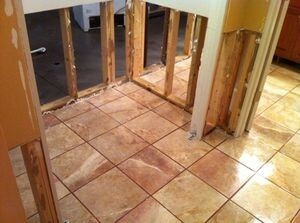 Don’t let a river of water damage wash away all of your memories and hard work in your home. And don’t wait a single second if you have already had a water damage crisis as hesitation will only worsen the issues. If you have an issue and you need the best there is to help solve it, then contact Yoav and his water damage West Jordan crews with 911 Restoration Salt Lake City today!